Click to open the section and read floatron reviews from our customers. For reasons of privacy and confidentially, we have only used our customers’ initials. If you have any feedback or a floatron review you would like to share, please contact us. “We have had our Floatron for approximately 4 years. We live in SW France and have used it in a mediaeval ‘pond’ which is stone lined and which is filled by water draining off the hill above. It measures 2.5 metres x 4 metres and is roughly 1.5 metres deep, obviously less in the heat of the summer. The wild life has introduced itself, mainly frogs and salamanders. I was concerned about the water quality but since using the Floatron we have never had any trouble except when I forgot to clean the electrode, then as soon as it had been cleaned, the water cleared. “We bought a Floatron from you knowing absolutely nothing about swimming pools. “I Purchased 2 floatrons from you last year, one for using in our fish pond and the other, on behalf of a friend for using in her swimming pool as we both had problems with algae in our respective pond and pool. I am pleased to advise you that the floatron was very successful in the friend’s swimming pool and was very helpful in being able tot stabilise our fish pond whilst an organic treatment was taking place. I have a floatron and I love it! Hello – we are now into our 3rd season with a floatron bought from you. It is really superb – can’t recommend it highly enough and we have long since recouped the cost with the lack of any need to buy more than £30 or so of chemicals a year + not needing to replace chlorine-wrecked swimsuits. The pool is 63 cubic metres, used for 8 months a year, under transparent polycarbonate cover for 6 months and left open for 6 months. Always sparkling blue! I have had my Floatron for a year now and have operated the pool through a full season, summer and winter, and so it is now a fitting time to give you my feedback. Increased uptime of pool usage. Substantial decrease in chemical usage and associated costs. No problems with Algae (Black or Green). No problems with irritation due to chlorine i.e. skin irritation or red eyes following swimming. Substantial decrease in backwashing and associated re-filling costs. Substantial reduction in the hours per day that I run the filtration system and associated costs of electricity. Ability to use backwash water as irrigation for my garden. No chemical attack on swimming attire and pool toys. Simple and easy installation and maintenance routines. Residue from cleaning routine of the Floatron used as “Miracle Grow” for my plants. In short the Floatron has done everything that you claim and as such I am a very satisfied customer and I wish you success in converting as many pool users as possible to your system. I have now been using the Floatron for 3 seasons. I am still on the original copper electrode, although it begins to look as if it could win the Turner prize. I generally use one large block of a 5 in 1 treatment in addition to the Floatron. I have had clear water in the pool during the whole season – not a single episode of water turning green or anything like that. My pool is 10 metres x 4 metres and mostly deep; it holds 70 cubic metres of water. I have no hesitation in recommending Floatron to all pool & pond owners – it really does work splendidly. We have just finished our first season using the floatron and we have had really clear water all season which has been great – this is particularly impressive as we had a problem with our pump and were unable to filter water for a week or so during the hottest part of the summer. Your advice did the trick. I think the Floatron is the best thing I have bought this year. It is magic. Just a line from sunny France to say ‘thank you for giving us our pool back’. After a new part to our salt machine, the floatron is working brilliantly. In 3 years we have never been free of algae for more than a week to ten days at a time. There is just no trace at all now, anywhere, and the water is sparkling and inviting the way a pool is meant to be. Cleaning is a 15 minute job rather than a 45 minute one. We are well impressed and won’t hesitate to recommend Floatron to anyone else. Please feel free to quote us if anyone has any doubts about its effectiveness. “A note to say how pleased I have been with my floatron® after my first full season of use. For the first time in 20 years my pool did not ‘go green’ on me! “The floatron has been in operation since the spring and what a wonderful piece of equipment it is. “I’d use it even if it didn’t save money and the environment – every pool should have one. We don’t need to give chemistry lessons to friends when we are away. “Just as I am packing the floatrons away into their winter quarters, I thought I should contact you to let you know that your floatrons went on to perform very well for us this year. We were well able to compare this year, how very much less chemical we had actually used in all, and have at last said goodbye to the last of the liquid chlorine!! “I am happy to report that the floatron performs extraordinarily well. The pool has never looked better, and several of our many visitors have, without prompting, commented on the clarity of the pool, and how sparkling the water appears to be. Furthermore, your claim that the chlorine tablet usage would decline, has been entirely substantiated. “To say I am absolutely delighted with the floatron is an understatement. The pool only holds approx. three thousand gallons (14 cubic metres), but it has always been a problem to keep clean. I have in the past used loads of Chlorine, which made the pool unusable. 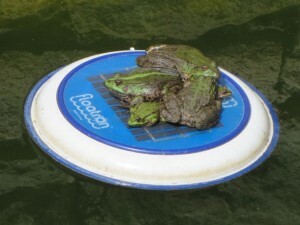 Since using the floatron, the pool has been in constant use. I only use a tiny amount of Chlorine now. My grandchildren and their parents enjoy the fact that it is the only pool where they do not get sore eyes at all. Of course another bonus is it rarely needs back washing, which means hardly any wastage of water. “I remain delighted by the performance of the floatron – I let the chlorine level go down until the tablet makes no pink colour at all, then chuck in a jug full of granules out of sheer cowardice. No wonder the pool companies don’t want to know – their after market in chemical sales would evaporate.” W. C.
“My pond was murky and full of algae despite paying a fortune for pond cleansing materials, wheat bales, and molluscs. When my neighbour that had a huge koi pond in his garden moved away he let me have his floatron and within two weeks my pond was crystal clear. “With reference to our recent visit, having been a Koi Keeper for some 20 years and tried every kind of blanket weed treatment on the market. What a revelation to have found floatron, In the four years I have used this bit of miraculous kit my pond of some 5,000 gallons has been completely clear of the pond keepers nightmare. All my fish are fighting fit with no problems whatsoever and my water lilies are plants are flourishing. I recommended floatron to many of the members of my Koi Club and all say it’s the best thing since sliced bread. “The pond had a large amount of algae etc making the pond water quite opaque. The pond is large and deep, and is a good test for the floatron. Not much change in the water clarity became apparent until a few weeks ago. About a fortnight ago it had become obvious that the water was becoming much clearer, and that the algae was disappearing, which I can attribute only to the floatron. “When I put the first one in my main koi fish pond, I have to say I was doubtful of the results. For years I have been trying to cope with the problem of blanket-weed, especially in the hot weather, and have tried a variety of chemicals with little success. The weed would clog the bottom drain which would block the filter and ultra violet light to the point that the only resort was to drain the pond and clear the weed by hand – an expensive process and stressful to the fish. My wife saw you advertisement in the Spectator and persuaded me to give it a try. This coincided with yet another pond clearing exercise and more advice for yet another couple of ‘experts’ – who this time recommended bundles of barley straw! (This would have been so unsightly; there would be no purpose on keeping a Koi pond) In fact, I was getting to the point of abandoning anyway. So when I installed the floatron, it was in new, clear water. Since this was done in early May, the water has remained clearer than I have ever known it, in spite of the recent extremely hot weather. The effect is that a greenish sludge accumulates at the bottom of the pond which is sucked through the drain into the filter unit from which I can easily pump it out from the first filter tank at two weekly intervals. As you recommend prevention is better than cure, and in this case I had the advantage of starting with clear water. I have a second pond which for various reasons cannot be drained and cleared of blanketweed manually. So how the second floatron copes with this remains to be seen.